This spring, Fr. Innocent Smith, O.P. 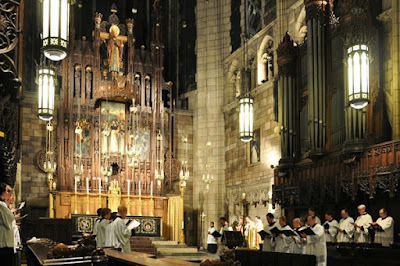 and James Wetzel will present a series of talks on the theme “Pray with Understanding: Participating in the Mysteries of the Mass.” The presentations will take place in the parish hall of the church of St Vincent Ferrer in New York City, located at 869 Lexington Ave; the first will be held this coming Tuesday, January 17th, from 6:45-7:45 p.m., and the series will continue until April 4th. Throughout the twelve sessions, they will delve into the mysteries of the Mass, explaining the history, symbolism, theological and musical dimensions of the liturgy. Fr Innocent writes in the parish bulletin: The Church’s liturgy sometimes feels mysterious. On one hand, this is fitting for what is at heart a participation in the Paschal Mystery of Christ’s Death, Resurrection, and Ascension. On the other hand, when we are mystified by the words and actions employed we can at times be distracted from the task at hand of entering into that Mystery more deeply—mysteries can obscure the Mystery. By learning why the liturgy employs the words and gestures that we encounter from week to week or from day to day, we can enter into the Mass with the conscious and active participation that Church desires for each member of the faithful. This spring, our Parish Study program aims to help members of our parish to come to a better understanding of the Mass so that we may more fully follow St. Paul’s exhortation to “pray with understanding” (1 Cor 14, 15). ... the twelve week class will give an overview of the parts of the Mass that we encounter each week: ... The class will be taught by me together with our director of music, James Wetzel. Each week we will consider different aspects of the words, actions, and music we encounter in the Mass. ... You are most welcome to attend each class or to drop in from time to time as your schedule allows. By participating in this Parish Study program, we hope that you may come to experience a deeper participation in the liturgy of the Church.